April 22, 2019: I just launched a Kindle book of my poem, "The Shadows Come Alive at Night." For the older kids, and the parents willing to admit the truth (and who love a good poem). Click here to check it out. ​Welcome to my world of ideas, where I love to entertain, provoke thought, and do my part in changing the world. You know, addressing the broken stuff like political structures, business models, education systems. The little things. 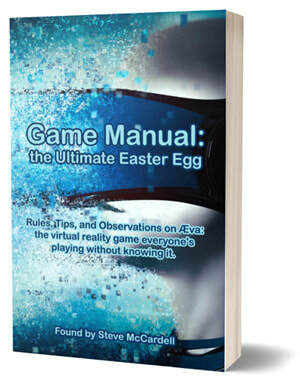 Game Manual: the Ultimate Easter Egg is my most recent project. Literally the game manual for life on Earth, something that took me 20+ years to find, written, you know, by the company that built this game for us. With all the details about how we're programmed, how to win, loads of observations on Earth life, and bombshells on topics like the historic global flood, NPCs, even things like reincarnation. Cheapest way you'll ever get life's manual! The Global Anthem Project (based on the book) is another project, promoting unity and hoping to one day raise funds for water wells around the world.